Weight loss is one of the hottest topics ever. Everyone seems to be trying to lose weight nowadays. But what’s the difference between weight loss & fat loss? People seem to use both terms interchangeably. After reading this post you’ll understand the difference between weight loss & fat loss, but also which one you should aim for and how. Weight Loss vs. Fat Loss. What’s the difference? Let’s start by defining weight loss & fat loss so you know what I mean here. Fat Loss. You want to lower your body fat, the amount of fat your body carries. Healthy goals are 10% body fat for men and 15% for women. Problems with Weight Loss. If you want to lose weight, it’s most likely because you carry too much fat. There are people who must lose weight, like athletes before a competition, but most want fat loss. So stop weighing yourself. Unreliable. Your body-weight can fluctuate daily since it’s influenced by your stomach/bowel/bladder content, water loss/retention, muscle loss/gain, fat loss/gain, … You’ll have no idea what’s going on. Irrelevant. 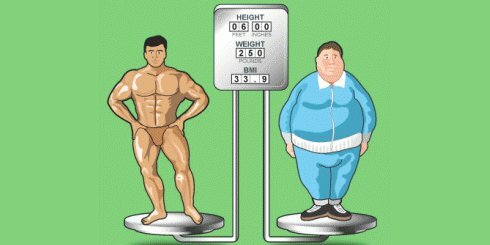 2 people with similar height can weigh the same, but look completely different because one has lower body fat than the the other. Check the picture at the top for an example. The last point shows why the BMI standard is flawed: it doesn’t take your body fat into account. Both guys in the top picture have the same BMI, but one is clearly healthier: his body fat is lower. Carbs & Water. Carbs bind to water. So eating less carbs will make you lose weight: water loss. This is why you lose so much weight on a diet like Atkins the first 2 weeks: it’s mostly water. Of course, increasing your carb intake will make you gain weight again: water retention. Muscle Gains & Fat Loss. You’ll gain muscle while losing fat when you get into strength training. But on the weight scale it will look like you’re not making progress: your body-weight doesn’t change. Track your body fat using a fat caliper and you’ll see your body fat is going down. Get Stronger. Strength training builds muscle & prevents muscle loss. It also helps sticking to your diet. Check the StrongLifts 5×5 routine. Eat Healthy. Eat whole unprocessed foods 90% of the time and eat less starchy carbs. Check the 8 nutrition rules. You can do cardio to speed up fat loss. But without strength training, cardio will cause muscle loss and you’ll end up skinny-fat. Avoid. How to Track Progress Efficiently. You don’t need to track progress weekly, changes wouldn’t be drastic enough. Track progress every 2 weeks. Stop Weighing Yourself Daily. The daily fluctuations will mess with your motivation. Weigh yourself once every 2 weeks, not more. Stop Looking in The Mirror. Self-image issues can skew perception. Shoot full body pictures and compare them with old ones. Track Body Fat. Get a fat caliper and track your body fat every 2 weeks. Use this how-to guide and watch this video. Take Measurements. Girth measurements of your neck, chest, arms, waist & thighs. Waist should go down, rest should go up. Shoot Pictures. Full body pictures from ankle to neck, front/back/side, every 2 weeks. Compare with your previous pics. Strength Stats. Keep a training log. Strength going up means muscle gains and strength training prevents muscle breakdown. You Might Not Want to Lose Weight. Big guys who want to lose weight often change their mind once they’ve lowered their body fat. They realize they prefer to stay big as long as their body fat is healthy. Focus on fat loss first. Once you’ve got your body fat down, check if you like what you see. Then decide if you still need to lose weight. You know it is just the same with everything in life. You’d think past showes us at least anything, but alas. Feel free to disagree but the world changes rapidly, and none of us have no control over it. E.g., If only Obama had any balls to put Vladimir to his place, but it seems like it’s never happening, welcome third world war.